theHotness | Cesária Évora – RIP! My first ever music review was for True magazine (the predecessor to sister mag Trace). It was early summer in 1995 and my assignment was to breakdown the hotness of Cesária Évora’s eponymous US debut. My editor told me that Ms. Évora was going to be in NYC later in the month and to make sure I see her perform in the flesh in order to get the full picture of why everyone from Madonna to Nina Simone to Wynton Marsalis was going absolutely gaga over this sister from Cape Verde. My roommate at the time had already turned me on to Cesária (earlier that year he had bought her record based solely on the fly picture emanating from the CD jewelbox) so I too was already smitten. We played Xandinha damn near every day! Something about it soothed our beings like buttery grits on a cold winter’s morning. Sho’ nuff Cesária’s NYC show at The Bottom Line that summer was sold out… been sold out, but I managed to get on the press list to see her perform, if I recall correctly, at The Museum of Natural History. I know it was either a Saturday or Sunday afternoon because I took my roommate and his daughter, who had to be about 7 years old. There was no school or work that day. The reason why I believe it was The Museum of Natural History is every time I recall seeing Cesária Évora perform that day I remember her being barefoot and divine and I remember seeing huge blocks of amethyst in glass cases and saying to myself ‘I’m surrounded by gems today!’ I may not remember every detail, but I remember her voice and her music transporting me right outta that museum to Cape Verde. I could feel a sea breeze and smell the fried snapper and lit cigars. I could taste the dark rum or maybe it was cognac and I could swear the moon was full and bright. She was just that deep and real. On Saturday when I read on Twitter that the “Queen of Morna” at the age of 70 had transitioned I was heartbroken. She was truly a rare gem! I only have three of her CD’s so I’m looking forward to indulging in the massive treasure of music she has left behind as her legacy and as her gift. No doubt I’m so very proud to say my very first music review was of Cesária— an excellent way to cut my teeth and kiss my spirit. I found that review yesterday and have it here below in its entirety. Rest in transcendent peace Cize! 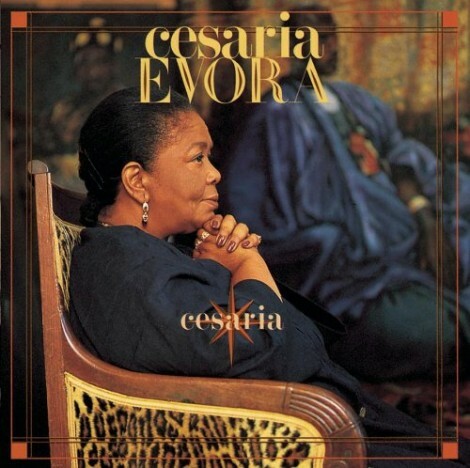 Listening to Cesária Évora’s record is like taking a luxury cruise in murky, polluted waters, getting your feet wet and cruddy, while catching porgies and lobster. Her lush contralto carries you nostalgically through the choppy waves of broken relationships and heartache, giving your spirit just enough space to dance and dream. Cize, who from press photos looks like a cross between Florida Evans of “Good Times” and Nina Simone isn’t all about soggy Kleenex and torment, however. In “D’nhirim Reforma” (Pension Money) she playfully warns young suitors that she’s knows their rap and can’t be had for cheap, especially when “old men nowadays spend their money on young girls.” “Rotcha ‘Scribida” hooks with a bone chilling whistling that stretches the mournful edge of this song into harrowing stillness. 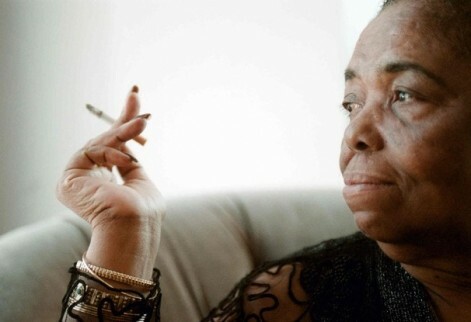 Cesária Évora’s twelve Portuguese- Creole crooned songs are not thrilling. They’re not even loud as she tends to sing mid-tempos all in the same key. But it’s this warm simplicity in which the Barefoot Diva brings the noise that makes this the best music to wake-up to since Wayne Shorter’s Native Dancer. Some how Cesária has discovered a way to mournfully sing with an optimistic nuance that makes her album invigoratingly rich and alive. – Nicole Moore – TRUE Magazine, 1995.